‘Captive In Iran’ is the chilling true story of two Christian Iranian women’s fight for survival in one of the world’s most notorious and brutal prisons, Evin. The daring pair had been breaking Islamic laws for years – by sharing their Christian faith. They had been handing out New Testaments in the major cities of Iran, setting up secret churches and evading the police having almost been caught several times. But it was only a matter of time before their activities caught up with them. In 2009 they were captured by the ‘Basiji’ (the Iranian Government’s militiamen). Maryam & Marziyeh were stripped of all their official documents, condemned to a place of torture and sentenced to death by hanging. But in the face of interrogation and intimidation something remarkable happened: they started a church. In ‘Captive In Iran’, the two women retell their experience of how God used their 259 days in Evin Prison to reverse the effects of darkness. By showing love to those in despair and hope to those who had lost everything, they shone an amazing light into one of the world’s darkest places. The official charges against them were apostasy, anti-government activity, and blasphemy, for which they were sentenced to execution by hanging. They spent 259 days in Evin, perhaps the world’s most notorious prison, as many around the world prayed for their release. Following international pressure and after months of interrogation and abuse, they were freed in November 2009 and subsequently cleared of all charges. They now live in the United States. 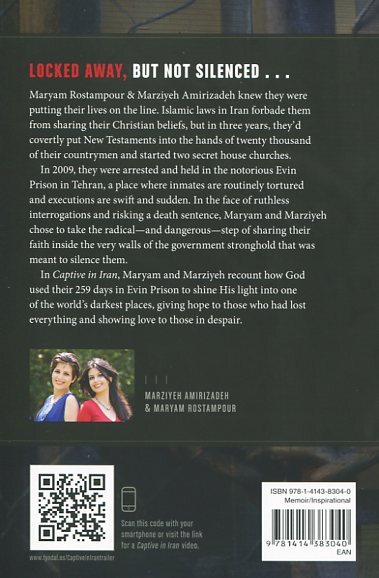 Captive In Iran by Maryam Rostampour and Marziyeh Amirizadeh was published by Tyndale House in April 2013. 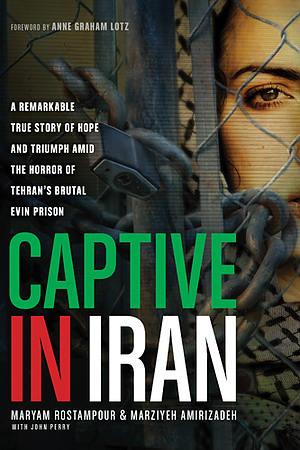 The ISBN for Captive In Iran is 9781414383040. Be the first to review Captive In Iran! Take a peek at some articles related to Captive In Iran. Got a question? No problem! Just click here to ask us about Captive In Iran. Embark on a chilling journey inside one of the worlds darkest and most dangerous places: Evin, the notorious Tehran prison. Here, prisoners are routinely tortured, abused, and violated. Executions are frequent and sudden. But for two women imprisoned for their Christian faithMaryam Rostampour and Marziyeh Amirizadehthis hell on earth was a place of unlikely grace as they reflected Gods love and compassion to their fellow prisoners and guards. Against all odds, Evin would become the only church many of them had ever known. In Captive in Iran, Maryam and Marziyeh recount their 259 days in Evin. Its an amazing story of unyielding faithwhen denying God would have meant freedom. Of incredible support from strangers around the world who fought for the womens release. And of bringing Gods light into one of the worlds darkest placesgiving hope to those who had lost everything, and showing love to those in despair.